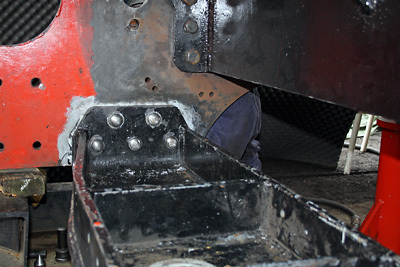 With the exception of two rivets in awkward corners, the smokebox saddle and the front radial arm support stretcher are both now riveted into the main frame plates. The stretcher in front of the saddle which supports the pivot centre for the front pony truck has now been replaced as has the horizontal stretcher to the rear of the saddle. Work is now proceeding on reaming the holes in these components preparatory to riveting them into the frame plates. The fitting work on the horn guides continues. Cerdic Foundries recently supplied photographs showing the advanced state of the patternmaking for the cylinders. Whilst the funds for casting the driving wheels are building up nicely there is still a long way to go before 82045 can sit on its own wheels. 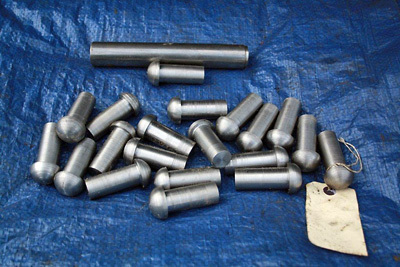 In addition to the purchase of axles and tyres and the relevant fitting work there is the casting and machining of twelve spring brackets, the manufacture of the springs, the patternmaking, casting and machining of the axleboxes and underkeeps. Then there is the pony trucks to consider. Another loco group is currently negotiating to have some castings made for a rear pony truck and in an ideal world it would make sense for us to join forces with them on this venture but as always more financial support is needed if we are to proceed along these lines. 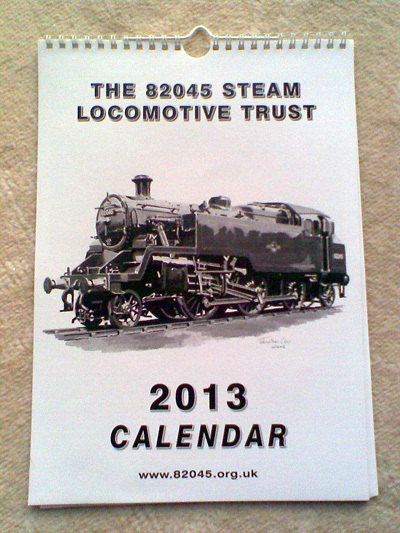 Following last years' success we have again commissioned a calendar for 2013. There are twelve black and white photographs including 82045 herself which is featured for December. To obtain your copy please send £6 (inc.p&p) to Mrs.Barbara Massau, 4 Southfield, Prestbury, Cheshire SK10 4XF. Please note supplies are limited following sales events at the Severn Valley Railway. The Trust's Third AGM will be held in the upstairs lecture room at Kidderminster Railway Museum on Saturday 6th April 2013 starting at 14.00. It has been arranged for this date in order to avoid clashing with the SVR Spring Gala (w/e 22-24 March) and the following Easter Weekend. We look forward to welcoming you on the day, so please attend if you can, and by all means bring a friend with you. There will be plenty to talk about thanks to the excellent progress on 82045, and we will be outlining our plans for the ensuing twelve months. As always, we welcome your constructive comments. On past record, meetings have been lively and positive, so we hope to maintain the tradition. For those of you with trains to catch, we anticipate that the business of the day should be concluded by about 15.30. Most of you will know the Museum, but for those who don't, it is well worth a visit. In addition to the exhibits, there is a pleasant tea room downstairs. The toasted sandwiches are highly recommended! Rivet head inside the frame plate and radial arm support stretcher. 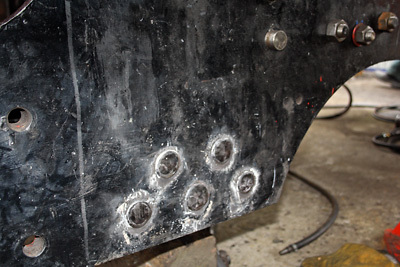 Newly formed rivet heads countersunk into the main frame plate. 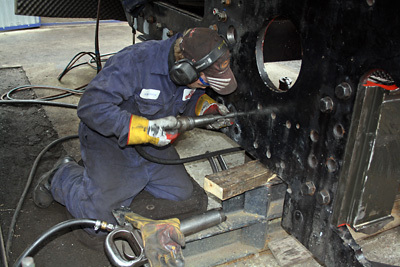 Ross Cooper using a pneumatic riveting gun on the outside of the main frame plate. 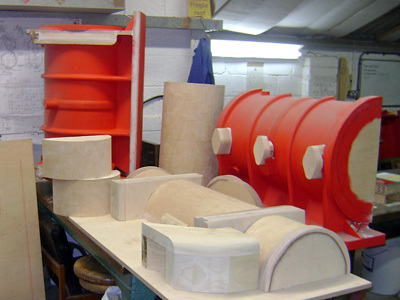 Patternmaking for the cylinders at Cerdic Foundries. Please contact Chris if you would like to discuss any of the above. He will keep a record of all sponsorship, but please tell him if you prefer to remain anonymous. All sponsors will receive a nice frameable certificate. We will soon be publishing additional lists of items for the front and rear pony trucks as well as boiler/firebox components, but for the moment are concentrating on the work at present in hand - namely, the cylinders and driving wheels. Thanks very much for reading this - we hope you will feel inspired to have a piece of 82045 you can claim as your own!